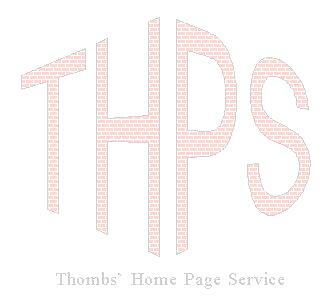 Thombs' Home Page Service (THPS) provides an array of web services for the Internet. If you are or ever have been interested in having your business, school, or organization represented on the Internet, or just want your own personal page, please review the different ways that we may be able to help you. We are interested in helping a number of special businesses, schools, and clubs join the Internet. Our mission is to help you evaluate the effectiveness of Internet advertizing. If you are looking for a personal home page we can let you design your own or design one for you. You will be given room for logos, pictures, up to three pages of standard text, links to your favorite sites, a listing in our master directory, and submission to two search engines. If you do not have a picture on disk, send us the actual picture and we will scan it for you.